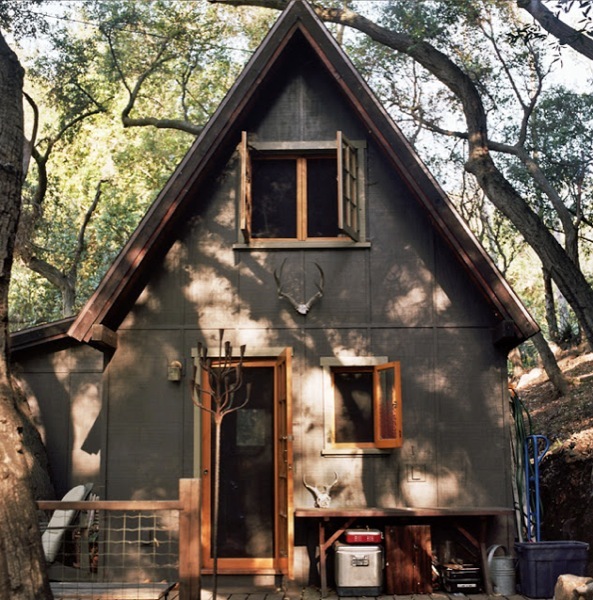 This is Daniel Kent’s cabin by a stream in the Angeles National Forest in southern California. He used to be an actor but he has lots of other talents, too. He can brew his own beer, roast his own coffee, teach and run his own business (he owns a coffee shop). His cabin is home and was designed by a shipbuilder who is good at making the most out of small spaces. The ladder to the loft is retractable, the couch and coffee table turns into a guest bed, and it is made out of reclaimed wood from another cabin that used to be on the property. Read more and see more over at Brian Ferry’s page here. Some of Brian’s prints are available to purchase here. If you enjoyed this reclaimed tiny cabin you’ll love our free daily tiny house newsletter! Ralph, I don’t know you, but we agree on a lot of stuff. Multi-colored kitchen, not my thing, but LOVE the retractable ladder, the lived in feel, almost like Ralph Lauren’s house (I saw it in a magazine once) only smaller, much much smaller. I could live here. I like looking at all these things because I get ideas from each one, some just make me chuckle. I got an idea from this with the railing of the loft – the translucent glass/plexiglass at the hand rail, LOVE THAT! It’s still open, yet safe, but light passes through. Great. I did notice the old phone, that cracked me up. SO much bulk for a small home. The record player, though would be quite nice. I love old records and the sound they made. I still think that is the best way, besides live, to hear music. Is that a big*ss bug shadow on the door? I guess it just comes with living in the woods. Love it. The land is so expensive. That’s the only problem! Now this is really cool!!!! Good find! That coffee table you’re ranting about is an essential part of the furnishings. If you had read instead of just glancing at it you’d know that the coffee table folds out and snaps into the couch to make a bed. No coffee table, no bed.